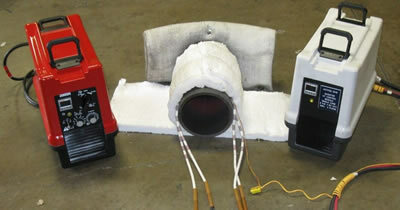 Resistance Heat Treatment | R.J. Kates Co.
R.J. Kates rents Resistance Heat Treatments for both small and large jobs. The benefit of the use of resistance heating pads is that they can be used for small heating jobs, such as the one demonstrated by the upper photo, by using a inverter welder as they only require 40-60 volts dc at a very low current to power them. 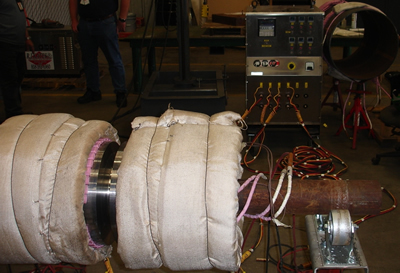 These resistance heat treatment pads are highly durable and able to withstand high temperatures over long durations. 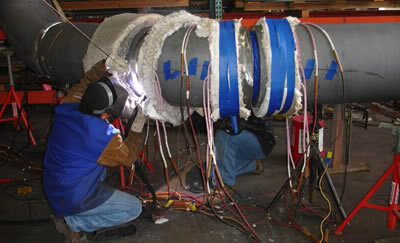 For large surface areas such as the pipe welding at CS Mechanical pictured in the photo in the right the larger pad units unit can be used. AFTEK is the sole remaining manufacturer of resistor controlled welding machines in the USA. In 1977, Big 4 Manufacturing introduced their innovative Series 77 Control, and the features introduced then remain at the heart of the AFTEK design: Edge-wound coils for better heat dissipation (thus better current control) and rotary switches for current selection. AFTEK and Big Four grids have been used to build nuclear power plants, to build and repair US Navy ships, for piping and vessels and with the exclusive Demand Pulse MIG, the thinnest sheet metal for food handling equipment, computer cases, aluminum boats.